Objective: To investigate the relevance of exosomes with structural changes of white matter and cognitive impairment in patients with Parkinson’s Disease (PD). Methods: 60 patients with PD were selected between January 2013 and December 2015. All patients were divided into 3 groups according to their cognitive function: PD-N group, PD-M group and PDD group. General characteristics were collected and analysed. The movement functions of PD patients were evaluated by the UPDRS and Hoehn-Yahr (modified) rating scale. Patients with cognitive impairment were evaluated with the MMSE and the MoCA. The GE 3.0 T MRI was used for examination. All the cases were scanned with routine MRI sequence and Diffusion Tensor Imaging (DTI) sequence. Fractional Anisotropy (FA) was measured for white matter nerve fibers of different brain regions of interest. The serum levels of TNF-α and α-synuclein were measured by ELISA. Results: The UPDRS and Hoehn-Yahr scale of PD increased gradually with the exacerbation of cognitive impairment (P<0.05). The proportion of Parkinson’s dementia in the middle and late group was significantly higher than that in the early group (P<0.05), while the proportion of the middle and late group with cognitive function was significantly lower than that of the early group (P<0.05). 21 out of 36 patients with normal MMSE scores had abnormal MoCA scores. Logistic regression analysis showing that the corpus callosum may be specific for the brain white matter; and so did the left temporal lobe and corpus callosum knee. The spearman correlation analysis showed that there was a negative correlation between regional brain white matter and Parkinson’s cognitive function. The levels of TNF-α and α-synuclein in the PD group were significantly higher than those in the normal control group (P<0.05). Conclusion: There should be a certain relationship between serum exosomes containing α-synuclein and cognitive impairment in PD. Parkinson’s disease (PD), Exosomes, Cognitive function, Diffusion tensor imaging (DTI), White matter. Parkinson’s Disease (PD) is a common degenerative disorder of the central nervous system that mainly affects the motor system. The most characteristic symptoms are tremor, rigidity, slowness of movement, and difficulty with walking [1,2]. These dyskinesia symptoms are thought to be caused by the lack of dopaminergic neuronal cell bodies located in the substantia nigra and axon projection of the striatum. Previous studies have focused too much on the motor symptoms of PD, while ignoring the importance of non-motor symptoms. Current studies generally suggest that non-motor symptoms of Parkinson's disease, such as mental disorders, cognitive impairment, and sleep disturbances, can eventually lead to a decline in quality of life or disability. Cognitive impairment is the most common non-motor symptoms of PD, including mild cognitive impairment or Parkinson's dementia. Injuries of white matter can lead to disorders of the neural circuitry associated with mental activity. Previous studies have demonstrated that white matter lesions are associated with the onset of Alzheimer's disease [3,4]. While, the association between white matter lesions and cognitive dysfunction in Parkinson's disease is unclear. Magnetic resonance Diffusion Tensor Imaging (DTI) can quantitatively measure white matter structure and evaluate the integrity of white matter in vivo [5,6]. White matter lesions cause changes in axonal orientation, resulting in reduced Fractional Anisotropy (FA) of white matter. Previous studies have shown that white matter damage is more severe in parkinsonism dementia than in other PD patients, which suggested that white matter lesions may play an important role in cognitive impairment of PD [7,8]. Exosomes are small membrane vesicles that are actively secreted by cells. Numerous studies have confirmed that the extracellular components of the nervous system play a major role in communication between cells, especially between neurons or neurons and glial cells. Numerous studies have shown that exosomes play an important role in neurodegenerative diseases such as PD and Alzheimer's disease. It has been demonstrated that exosomes are capable of transporting a variety of substances in the nervous system cells, especially between neurons or neurons and glial cells. Many studies have shown that exosomes play an important role in the progression of neurodegenerative diseases such as PD or Alzheimer's disease. This study aimed to explore the changes of exosomes and white matter structure in PD patients with different cognitive impairment, revealing the relationship between white matter structure and cognitive function of exosomes in PD patients. PD group: Between January 2013 and December 2015, 60 patients with PD were admitted to this study, including 32 male and 28 female patients with a mean age of 64.7 ± 6.9 y.
AInclusion criteria: According to the guidelines for PD of the European Union of Neurology (2013), (1) Slowness of movement; (2) At least one of the following symptoms: resting tremor, myotonia, postural balance disorders; (3) Symptoms progress gradually; (4) Levodopa treatment is effective; (5) PD course of more than 4 y.
BExclusion criteria: (1) Parkinson's syndrome (e.g. stroke, inflammation of CNS, metabolic diseases, toxic diseases, brain trauma, brain tumors); (2) Patients suffering from heart, liver or kidney diseases; (3) Patients with primary PD who had experienced stereotactic ablation of nucleus or DBS previously; (4) Patients with severe mental illness; (5) Patients with contraindication for MRI examination; (6) SDS ≥ 50. CPD patients were divided into 3 groups according to their cognitive status: (1) Cognitive normal group (PD-N); (2) Mild cognitive impairment group (PD-M); (3) Parkinsonism Dementia (PDD). Control group: 20 normal controls were selected from outpatient, matched for age and gender, whose MMSE scores were not less than 26. Medical ethics: The unit medical ethics research committee has been approved by this research, and the approval number is 2013-2015. General data: Age, gender, nationality, onset time. Hoehn-Yahr stage and UPDRS motor score were recorded at on-stage of PD. The Mini Mental State Examination (MMSE) was selected to evaluate the cognitive status of PD and control groups [9,10]. The scale includes the 11 items in the following: temporal orientation, attention and calculation, language and praxis, instant memory recall, short-term memory recall, naming, repetition, reading, writing and graphic copying. Score one point for each correct response. The scores can be interpreted according to education level: abnormal for illiteracy<17scores, abnormal for primary school education<20 scores, abnormal for more than primary school education<24 scores. MoCA was selected to evaluate cognitive status of PD and control groups [9,10]. The scale contains the following eight items: visuospatial/executive, memory, naming, attention, language, abstraction, delayed recall and orientation. The scores should be corrected according to education level. There was a positive correlation between cognitive function and MoCA score. A score below 26 points indicates that cognitive impairment has developed. All tests should be done by the subjects themselves. Diffusion Tensor Imaging (DTI): Routine MRI sequence and DTI sequence were acquired at 3.0 Tesla. 3.0T magnetic resonance was purchased from GE company (Model: DiscoveryMR750 3.0T). DTI sequence contains 16 directions and a total of collection (44 × 16) slices. DTI data were analyzed with Functool software on AW4.4 computer workstation, and the Fractional Anisotropy (FA) values were measured for different ROI of white matter. Blood samples (6 ml) were collected using EDTA and anticoagulant tube for all PD groups and healthy control group in the morning of peripheral blood, high-speed centrifuge at 1400 rpm (4°C) for 15 min. Then supernatant was stored in a -80°C refrigerator for ELISA. ELISA was purchased from Beijing Wantex Company (Batch number: B20131024). Automatic ELISA processing system was purchased from the Swiss Himilton Medical Company (Model: FAME16/20). Statistical analysis was performed using the Statistical Package for the Social Sciences software (version 19.0) (SPSS, Chicago, IL, USA). Chi-square test was used for count data among groups, t-test was used to compare between the occurrences frequencies Spearman correlation and Logistic regression analysis was used for FA value of white matter and different cognitive status. Levene variance homogeneity test, variance homogeneity analysis of variance, variance deviation were ranked test, count data between the uses of Pearson test. The correlations of serum α-synuclein, cognitive impairment and FA were analyzed by Spearman correlation. Statistical significance was considered at a value of P<0.05. There was no significant difference within the age and gender distribution of all the PD and control groups (P>0.05), as well as their course of disease (P>0.05). UPDRS of PD-NPD-M and PDD was 31.3 ± 11.2, 44.2 ± 14.5 and 57.4 ± 16.2, respectively, indicating that UPDRS increased with the cognitive impairment status (P<0.05). Hoehn-Yahr scale of PD-N, PD-M and PDD was 2.3 ± 0.8, 2.9 ± 0.8 and 3.7 ± 0.9, respectively, indicating that Hoehn-Yahr scale increased with the cognitive impairment status (P<0.05) (Table 1 and Figures 1 and 2). PD-N: PD with normal cognitive status; PD-M: PD with mild cognitive impairment; PDD: PD with dementia. Table 1. Demographics and clinical characteristics of PD with different cognitive status and controls. Figure 1: UPDRS of PD with different cognitive status. The levels of UPDRS in PD-M and PDD groups were significantly higher than those in the PD-N group (P<0.05). Figure 2: Hoehn-Yahr stage of PD with different cognitive status. The levels of Hoehn-Yahr stage PD-M and PDD groups were significantly higher than those in the PD-N group (P<0.05). According to the Hoehn-Yahr stage of PD, 60 Parkinson's patients were divided into two groups: early stage group and later stage group (Table 2). There were significant differences in gender distribution between the two groups (χ2=22.94, P<0.05). In early stage group, the percentage of PD-N, PD-M and PDD were 50.0%, 34.5% and 11.3%, respectively. PD-N: PD with normal cognitive status; PD-M: PD with mild cognitive impairment; PDD: PD with dementia; *Indicating a statistically significance between early stage PD and later stage (P<0.05). Table 2. The distribution of cognitive status between PD in early stage and in later. In later stage group, the percentage of PD-N, PD-M and PDD were 16.7%, 30.0% and 51.3% respectively. The proportion of Parkinson's dementia in later group was significantly higher than that in early stage group (P<0.05) (Table 2 and Figure 3). 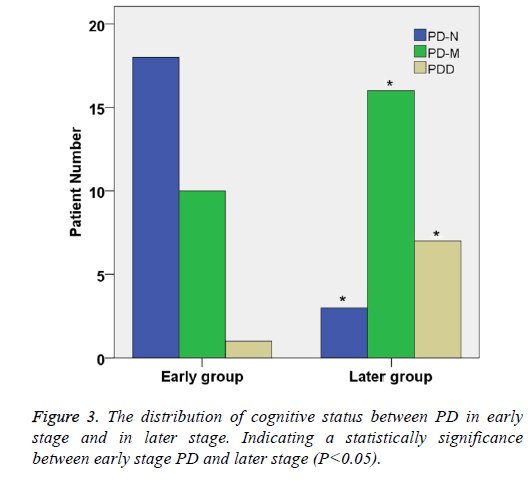 Figure 3: The distribution of cognitive status between PD in early stage and in later stage. Indicating a statistically significance between early stage PD and later stage (P<0.05). The total MoCA score of PD-N, PD-M and PDD were 22.2 ± 4.2, 19.2 ± 5.1, 15.9 ± 5.2, respectively, showing that total score MoCA of patients decreased with status of cognitive impairment (P<0.05). The total MMSE score of PD-N, PD-M and PDD were 25.3 ± 2.8, 24.3 ± 4.8, 21.7 ± 5.9, respectively showing that total MMSE score decreased with status of cognitive impairment (P<0.05). Compared with the control group, the scores of MoCA and MMSE decreased significantly in PD group (P<0.05). When MMSE was selected as the criteria of cognitive status for PD patients, there were 24 cases (24/60) of abnormal. But the number of abnormal increased to 45 (45/60) under the criteria of MoCA. These results indicate that MoCA scale is more sensitive than MMSE in assessing cognitive impairment in Parkinson's patients, whereas MMSE may have a higher specificity (Table 3 and Figure 4). *Indicating a statistically significance between control group and experimental group (P<0.05). Table 3. MoCA and MMSE of PD with different cognitive status and controls. 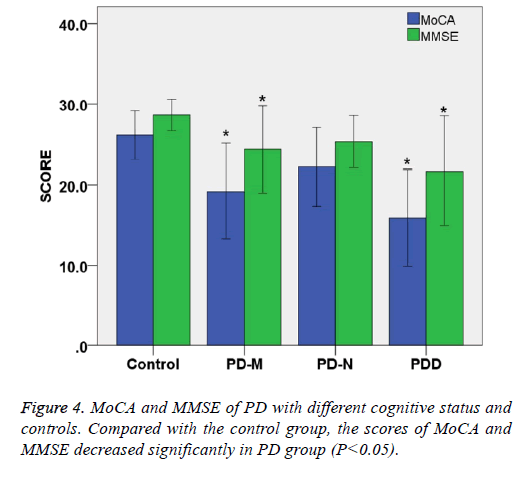 Figure 4: MoCA and MMSE of PD with different cognitive status and controls. Compared with the control group, the scores of MoCA and MMSE decreased significantly in PD group (P<0.05). Compared with the control group, FA value of left frontal lobe, right temporal lobe and bilateral anterior cingulate in PDD and PD-M group decreased significantly (P<0.05). The FA value of the left temporal lobe and corpus callosum of the PD-M group decreased significantly (P<0.05), and so did the left occipital or left anterior cingulate band of the PD-N group (P<0.05). The FA values of left anterior cingulate and corpus callosum in PDD group were significantly lower than those in PD-M group and PD-N control group (P<0.05). Logistic regression analysis indicate that the correlation was significant between FA value of the corpus callosum and cognitive impairment of PD (P<0.05). The FA values of the left occipital lobe, left anterior cingulate cortex and the splenium of corpus callosum in the PDD group were lower than those in the PD-N group. Logistic regression analysis indicate that the correlation was significant between FA value of the left anterior cingulate and cognitive impairment of PD (P<0.05). The results of Spearman correlation analysis showed that the left frontal lobe (r=-0.343, P<0.05), the right temporal lobe (r=-0.393, P<0.05), the left occipital lobe (r=-0.231, P<0.05), the left anterior cingulate (r=-0.396, P<0.05), right anterior cingulate (r=-0.241, P<0.05) (Table 4). Table 4. FA value of white matter of PD with different cognitive status and control. The levels of TNF-α and α-synuclein in PD and control groups were compared statistically. The levels of TNF-α and α- synuclein in the PD-N, PD-M and PDD groups were significantly higher than those in the control group (P<0.05). Spearman rank correlation analysis shows the correlation of serum α-synuclein and PD cognitive status, the results are as follows: Parkinson's cognitive function normal (r=0.446, P<0.05), PD with mild cognitive impairment (r=0.492, P<0.05) and Parkinson's dementia (r=0.432, P<0.05). Spearman rank correlation analysis shows the correlation of serum TNF-α and PD cognitive status, the results are as follows: Parkinson's cognitive function normal (r=0.382, P<0.05), PD with mild cognitive impairment (r=0.414, P<0.05) and Parkinson's dementia (r=0.378, P<0.05) (Table 5 and Figures 5 and 6). Table 5. Concentration of serum TNF-a and a-synuclein of PD with different cognitive status and control. 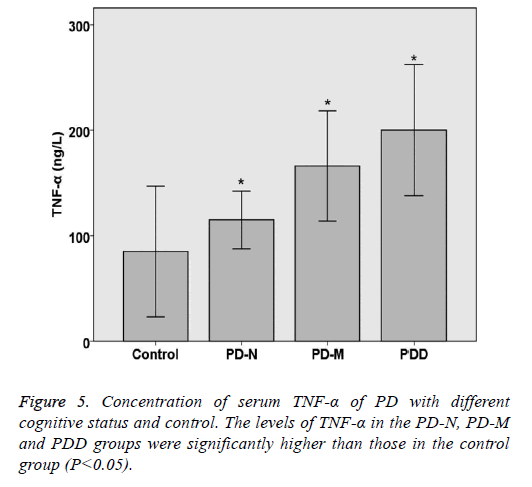 Figure 5: Concentration of serum TNF-a of PD with different cognitive status and control. The levels of TNF-a in the PD-N, PD-M and PDD groups were significantly higher than those in the control group (P<0.05). 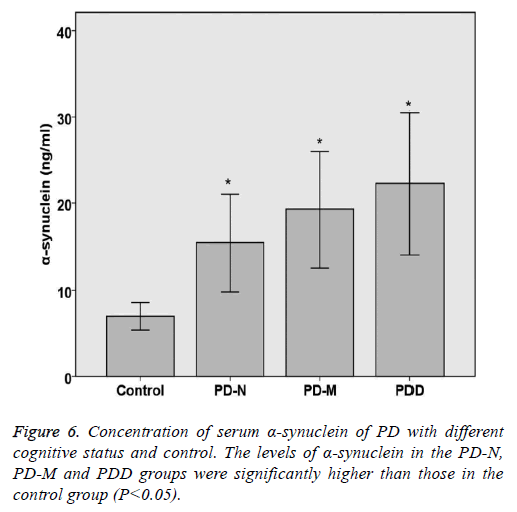 Figure 6: Concentration of serum a-synuclein of PD with different cognitive status and control. The levels of a-synuclein in the PD-N, PD-M and PDD groups were significantly higher than those in the control group (P<0.05). PD is a common clinical degenerative disease of the central nervous system, which usually occurs in the elderly. With the aging of the population, the incidence of PD in China was increasing gradually [11,12]. PD progresses gradually with the course of disease. Not only the progresses of motor symptoms, but also some non-motor symptoms, such as cognitive impairment, sleep disorders, which increased the burden on families and society . Although recent advances in PD cognitive impairment have made great progress, it remains unclear. Therefore, there is an urgent need to find more effective ways to screen and identify cognitive dysfunction in patients with Parkinson's disease in order to early intervention and inhibit cognitive dysfunction. There is increasing evidence shows that LRRK2 may be involved in the endosomal process, including the binding to RAB5B, a member of the RAS oncogene family, which involved in fusion of MVBs with cytoplasmic membrane and secretion of exosomes [14,15]. Mutations in this gene-related site can lead to abnormal aggregation of intracellular plaques and induce the generation of large amounts of exosomes containing toxic α-synuclein [16,17]. Toxic α-synuclein will be transported into the normal neurons cells via the secretion of exosomes, resulting in accumulation of toxic α-synuclein in neuron and microglia activation [18,19]. Activation of microglia can produce rich in tumor necrosis factor-α (TNF-α) and other inflammatory factors of exosomes, increased neurotoxicity, and promote the development of PD [20-22]. The development of neuroimaging has also made great progress, by diffusion tensor imaging of magnetic resonance imaging of the white matter can be more accurate to determi	ne the integrity of nerve fibers, for the diagnosis of cognitive dysfunction provides a reference [23,24]. In this study, the use of magnetic resonance diffusion tensor imaging technology on white matter structure changes with cognitive impairment of PD were studied, the results show that Parkinson's patients with dementia after its left frontal lobe, right temporal lobe and bilateral The FA value of the white matter in the anterior cingulate cortex decreased and the white matter in the genu of the corpus callosum could be identified by Logistic regression analysis. The FA values of the left temporal lobe and the corpus callosum were decreased when the mild cognitive impairment occurred. Logistic regression analysis show that the results of Spearman correlation analysis of brain white matter and Parkinson's cognitive function in different regions suggested that there was a negative correlation between them. These results suggest that the cognitive impairment of PD is more serious, the white matter of the corresponding parts of brain, the more obvious the decrease of FA value. In the present study, the levels of serum TNF-α and α- synuclein in PD patients with different cognitive functions were compared. The results showed that the levels of TNF-α and α-synuclein were significantly higher in PD Significantly higher than the normal control group (P<0.05), and with the degree of increase in cognitive function of patients with increased state. The Spearman rank correlation analysis showed that the cognitive function impairment of PDD was more serious, the levels of TNF-α and α-synuclein were higher in PDD group than in other group. A positive correlation between the TNF-α and α-synuclein. The increased content of α-synuclein in peripheral blood can reflect the effect of exosomes on the progression of PD. In summary, we found the high incidence of cognitive impairment in PD. The MoCA scales are more sensitive to detecting cognitive impairment in PD patients; and the corpus callosum and left anterior cingulate changes on DTI might be valuable for the diagnosis of cognitive dysfunction in PD. There should be a certain relationship between serum exosomes containing α-synuclein and cognitive impairment in PD. Halliday GM, Leverenz JB, Schneider JS, Adler CH. The neurobiological basis of cognitive impairment in Parkinson's disease. Mov Disord 2014; 29: 634-650. Yarnall AJ, Breen DP, Duncan GW, Khoo TK, Coleman SY, Firbank MJ, Nombela C, Winder-Rhodes S, Evans JR, Rowe JB, Mollenhauer B, Kruse N, Hudson G, Chinnery PF, O'Brien JT, Robbins TW, Wesnes K, Brooks DJ, Barker RA, Burn DJ. Characterizing mild cognitive impairment in incident Parkinson disease: the ICICLE-PD study. Neurol 2014; 82: 308-316. Zheng L, Vinters HV, Mack WJ, Weiner MW, Chui HC. Differential effects of ischemic vascular disease and Alzheimer's disease on brain atrophy and cognition. J Cereb Blood Flow Metab 2016; 36: 204-215. Crystal HA, Schneider JA, Bennett DA, Leurgans S, Levine SR. Associations of cerebrovascular and Alzheimer's disease pathology with brain atrophy. Curr Alzheimer Res 2014; 11: 309-316. Thomas C, Ye FQ, Irfanoglu MO, Modi P, Saleem KS, Leopold DA, Pierpaoli C. Anatomical accuracy of brain connections derived from diffusion MRI tractography is inherently limited. Proc Natl Acad Sci USA 2014; 111: 16574-16579. Meijer FJ, Bloem BR, Mahlknecht P, Seppi K, Goraj B. Update on diffusion MRI in Parkinson's disease and atypical parkinsonism. J Neurol Sci 2013; 332: 21-29. Kandiah N, Mak E, Ng A, Huang S, Au WL, Sitoh YY, Tan LC. Cerebral white matter hyperintensity in Parkinson's disease: a major risk factor for mild cognitive impairment. Parkinsonism Relat Disord 2013; 19: 680-683. Shin J, Choi S, Lee JE, Lee HS, Sohn YH, Lee PH. Subcortical white matter hyperintensities within the cholinergic pathways of Parkinson's disease patients according to cognitive status. J Neurol Neurosurg Psychiatry 2012; 83: 315-321. Pendlebury ST, Mariz J, Bull L, Mehta Z, Rothwell PM. MoCA, ACE-R, and MMSE versus the National Institute of Neurological Disorders and Stroke-Canadian stroke network vascular cognitive impairment harmonization standards neuropsychological battery after TIA and stroke. Stroke 2012; 43: 464-469. Hoops S, Nazem S, Siderowf AD, Duda JE, Xie SX, Stern MB, Weintraub D. Validity of the MoCA and MMSE in the detection of MCI and dementia in Parkinson disease. Neurol 2009; 73: 1738-1745. Svenningsson P, Westman E, Ballard C, Aarsland D. Cognitive impairment in patients with Parkinson's disease: diagnosis, biomarkers, and treatment. Lancet Neurol 2012; 11: 697-707. Ma CL, Su L, Xie JJ, Long JX, Wu P, Gu L. The prevalence and incidence of Parkinson's disease in China: a systematic review and meta-analysis. J Neural Transm (Vienna) 2014; 121: 123-134. Pedersen KF, Larsen JP, Tysnes OB, Alves G. Prognosis of mild cognitive impairment in early Parkinson disease: the Norwegian ParkWest study. JAMA Neurol 2013; 70: 580-586. Aarsland D, Pahlhagen S, Ballard CG, Ehrt U, Svenningsson P. Depression in Parkinson disease-epidemiology, mechanisms and management. Nat Rev Neurol 2011; 8: 35-47. Broeders M, Velseboer DC, de Bie R, Speelman JD, Muslimovic D, Post B, de Haan R, Schmand B. Cognitive change in newly-diagnosed patients with Parkinson's disease: a 5-year follow-up study. J Int Neuropsychol Soc 2013; 19: 695-708. Rideout HJ, Stefanis L. The neurobiology of LRRK2 and its role in the pathogenesis of Parkinson's disease. Neurochem Res 2014; 39: 576-592. Schapansky J, Nardozzi JD, LaVoie MJ. The complex relationships between microglia, alpha-synuclein, and LRRK2 in Parkinson's disease. Neuroscience 2015; 302: 74-88. Shi M, Liu C, Cook TJ, Bullock KM, Zhao Y, Ginghina C, Li Y, Aro P, Dator R, He C, Hipp MJ, Zabetian CP, Peskind ER, Hu SC, Quinn JF, Galasko DR, Banks WA, Zhang J. Plasma exosomal alpha-synuclein is likely CNS-derived and increased in Parkinson's disease. Acta Neuropathol 2014; 128: 639-650. Tsilioni I, Panagiotidou S, Theoharides TC. Exosomes in neurologic and psychiatric disorders. Clin Ther 2014; 36: 882-888. Taylor JM, Main BS, Crack PJ. Neuroinflammation and oxidative stress: co-conspirators in the pathology of Parkinson's disease. Neurochem Int 2013; 62: 803-819. Chang C, Lang H, Geng N, Wang J, Li N, Wang X. Exosomes of BV-2 cells induced by alpha-synuclein: important mediator of neurodegeneration in PD. Neurosci Lett 2013; 548: 190-195. Irwin DJ, Lee VM, Trojanowski JQ. Parkinson's disease dementia: convergence of alpha-synuclein, tau and amyloid-beta pathologies. Nat Rev Neurosci 2013; 14: 626-636. Zheng Z, Shemmassian S, Wijekoon C, Kim W, Bookheimer SY, Pouratian N. DTI correlates of distinct cognitive impairments in Parkinson's disease. Hum Brain Mapp 2014; 35: 1325-1333. Li C, Huang B, Zhang R, Ma Q, Yang W, Wang L, Xu Q, Feng J, Liu L, Zhang Y, Huang R. Impaired topological architecture of brain structural networks in idiopathic Parkinson's disease: a DTI study. Brain Imaging Behav 2017; 11: 113-128.